WPC News Desk : Tata Motors has once again made a huge achievement by roping in Lionel Messi as their global ambassador for passenger vehicles. 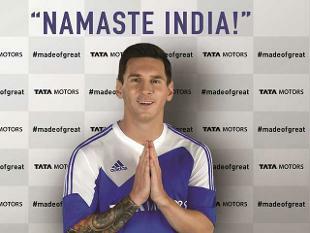 Messi would be heard greeting with ‘Namaste India’ soon. President of the Passenger Vehicle Business Unit of Tata Motors Mayank Pareek, on Monday (02 November), told the media that Messi is a youth icon and an inspiring character. He further said, the company is overjoyed to get a scope to work with this modern football maestro. The on and off the field qualities of this extraordinary player would be kept in mind while preparing the advertisement campaign, Pareek added. Messi, in his reaction, also expressed happiness over the new tie-up. Expressing his interest about India Messi assured that he would visit the country in future. He hoped that this new venture would be extremely successful.